Native American Indians were a deeply spiritual people and they communicated their history, thoughts, ideas and dreams from generation to generation through symbols. The concept of the family would have been conveyed via a pictogram or using a number of symbols which when put together convey a different meaning and tell a story. The Family Symbol is therefore a combination of the Native American symbol for a man, woman, boy and girl. It is also worth noting that a deer symbolized family protection. In Lakota Sioux mythology, Chapa is the beaver spirit and and symbolizes domesticity, labor and preparation. 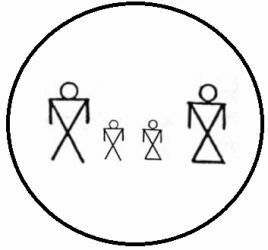 The family symbol of the man, woman and children are surrounded by a circle. A circle around other Native American symbols signifies family ties, closeness & protection. The circle has no break and holds that which cannot be broken. The circle is used as a basis for many symbols including the cycle of life from birth to death to rebirth. The raising of children was the responsibility of many relatives, not just the biological mother and father. In many Native American cultures each child had many fathers, many mothers, and many siblings. The family symbol can be used as several icons. A woman symbol in a circle is combined with the symbols for a boy and girl and can be interpreted as a Mother and child symbol. It might also be interpreted as a symbol of a grandmother. The Symbol for Sisters depict a similar icon with two women who are positioned side-by-side representing unity and equality. The Symbol for Brothers are represented by a similar sign. The line connecting the symbols indicates that they are brothers or sisters who are bonded together and share a journey through life. The family symbol is in a fact a cross between a pictogram and a symbol. The family symbol consisting of men, women and children is featured in many pictograms. A pictogram, also called a pictograph, conveys a story and meaning through pictures that signify and resemble the shapes of physical objects or people. An Ideagram is another form of pictogram which conveys complex ideas, feelings and emotions. A pictogram is a therefore a form of writing which uses drawings to tell a story. The Native American family unit was often misunderstood by the European settlers. The Indian family divided the workload between men and women. The men were responsible for making weapons, hunting and protecting the family. Hunting and fishing were deemed as recreational by the Europeans so Indian men were deemed to be lazy. The women were viewed as the hard workers. They looked after the home and the family including the building and upkeep of their shelter, making clothes, fetching water and preparing food. Much of the work of women required physical labor which Europeans found unacceptable. The Europeans also disapproved of the lenient treatment of the children in the family unit. Native American children were given gifts, rarely chastised and never beaten. The family symbol is also represented by a triangle symbol which reflects the shape of the tepee which is the home to many many Native American tribes.